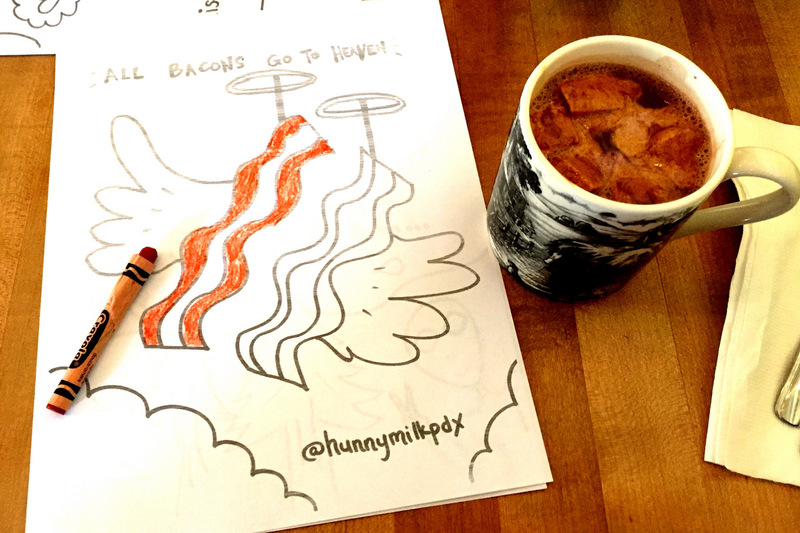 One of the best brunches in Portland has a new pop-up home. HunnyMilk is a pop-up brunch by Chef Brandon Weeks held on Saturday and Sunday from 9 am to 2 pm. It has moved to the La Buca restaurant space at 40 NE 28th Avenue, Portland, Oregon. Both the food and the vibe are playful. The La Buca space is much larger than their former pop-up space at Hogan’s Goat. You are greeted by Alex Franzen and ushered to your table where you have coloring sheets, crayons and pencils and games like a Rubik’s Cube. There are no reservations, so the larger space is welcome for those who want less of a wait. Now comes the hard part – choosing your brunch. The $20 meal includes one drink, one sweet and one savory. You can add on booze to your juice, coffee, or cocoa or enjoy one of their three extra sides. That said, the meal itself is going to fill you up and smaller appetites may be taking some home. The caramel hot chocolate with toasted milk marshmallows is likely the best cocoa you’ve ever had. 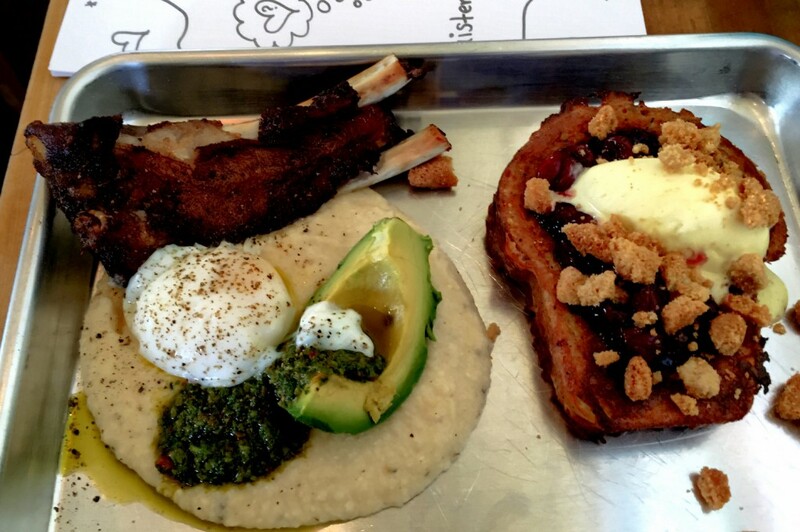 The savory choices include Weeks’ succulent crispy pork ribs, served with cheesy garlic grits, poached egg, avocado, and chimichurri. Once you’ve had them, it’s hard to make another savory choice for your next trip. The quiche with caramelized onions, mushrooms, and miso is served with a green salad. Another recent choice is a cronut sandwich with egg, bacon, cheddar and spicy maple. All of the savories are interesting, intricate and reveal the chef’s pedigree from Charlie Trotter’s (Chicago), Bouchon (Napa Valley), Urban Farmer, The Painted Lady, and Renata (Portland). 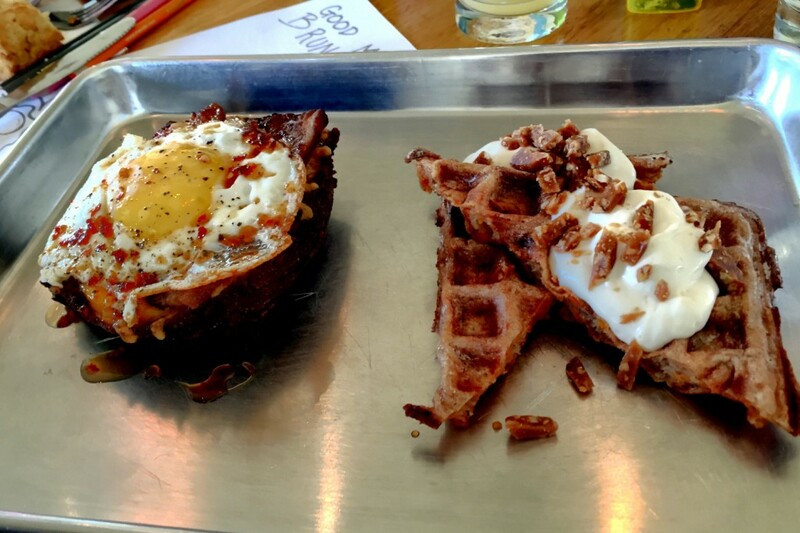 Magical sausage egg savory with carrot cake waffle sweet. The sweet choices are also creative and delicious. 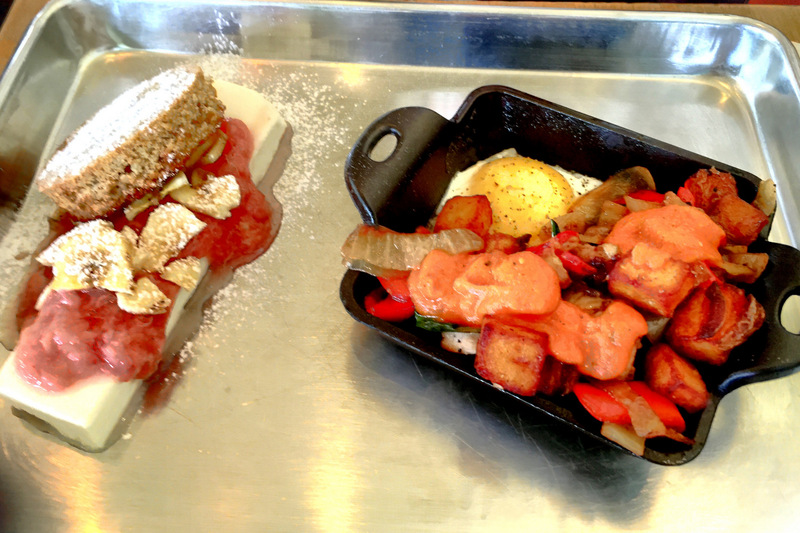 Recent visits included the poppy seed French toast with cabernet cherries, almond streusel and creme brulee ice cream and a carrot cake waffle with cream cheese mousse and black walnut toffee. Brown butter oat cake toast sweet with pork brisket hash savory. If you have a lighter appetite, you might want to share a tray with a friend and add on a side such as the chocolate chunk monkey bread with peanut butter custard. 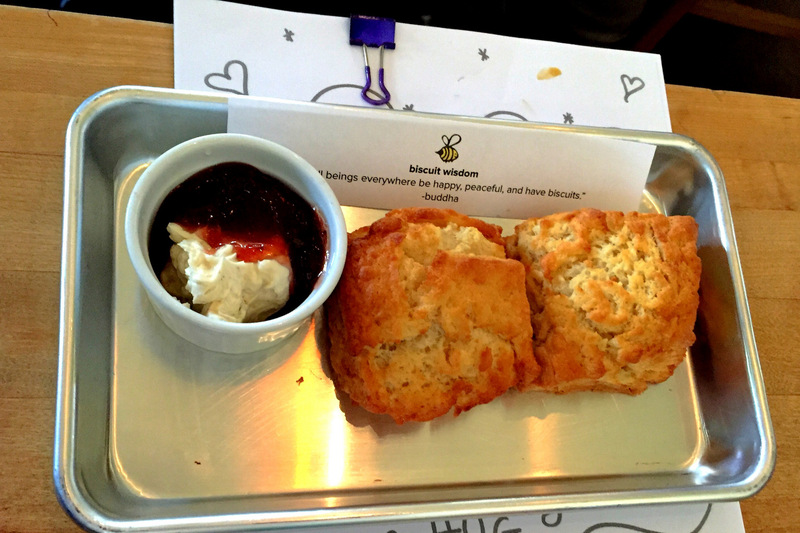 Buttermilk biscuits with honey butter and jam. 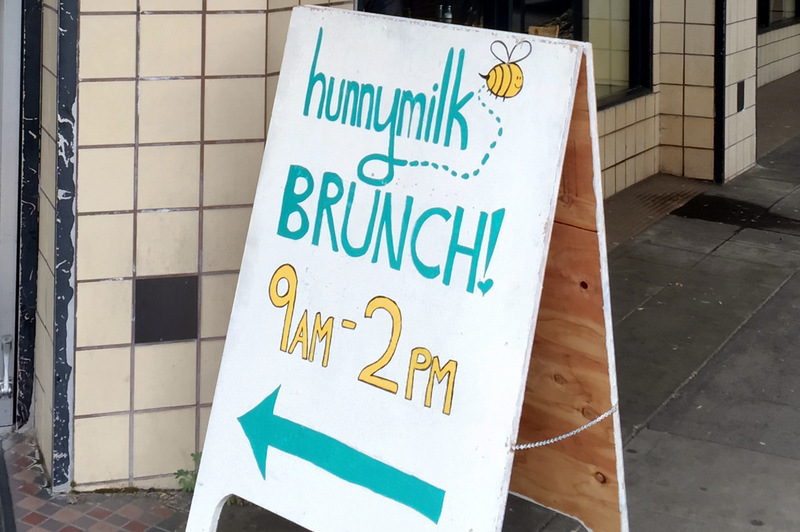 On the first Saturday of the month, you can stop by and enjoy the Letters and Brunch. You’ll get the same great menu but also envelopes, cards, pens, sticker and postage stamps so you can compose missives to the people in your life who need to hear from you non-electronically. For more fun, HunnyMilk hosts a Wake and Bake in coordination with High 5 Tours and Pure Green. It includes picking up a bag full of cannabis goodies from the partner dispensary in advance, enjoying them on the High 5 bus, and then enjoying the HunnyMilk brunch, unlimited non-alcoholic beverages, coloring sheets, games, and classic cartoons on an 8-foot projector screen at a private loft location. Non-imbibers are welcome to join in. Pajamas and loungewear are encouraged, with a brunch gift card to the best ensemble. 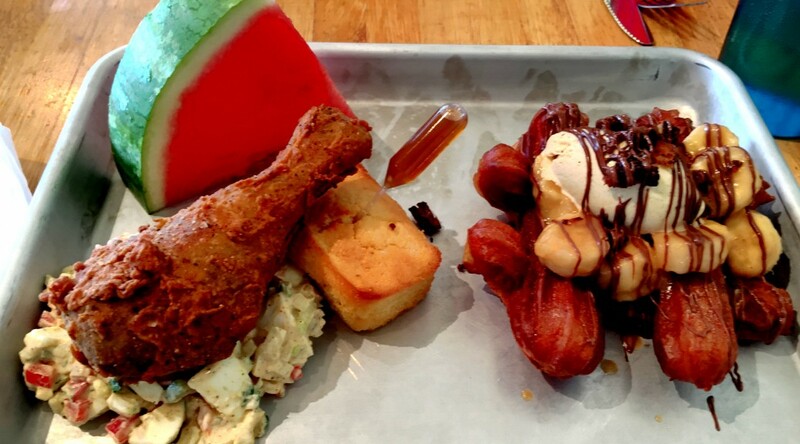 On our most-recent visit, they offered the picnic savory – fried chicken that had first been slowly cooked sous vide to capture maximum flavor, then quickly fried for a crispy skin. I’m very picky about my fried chicken, and this chicken leg was nothing less than awesome. 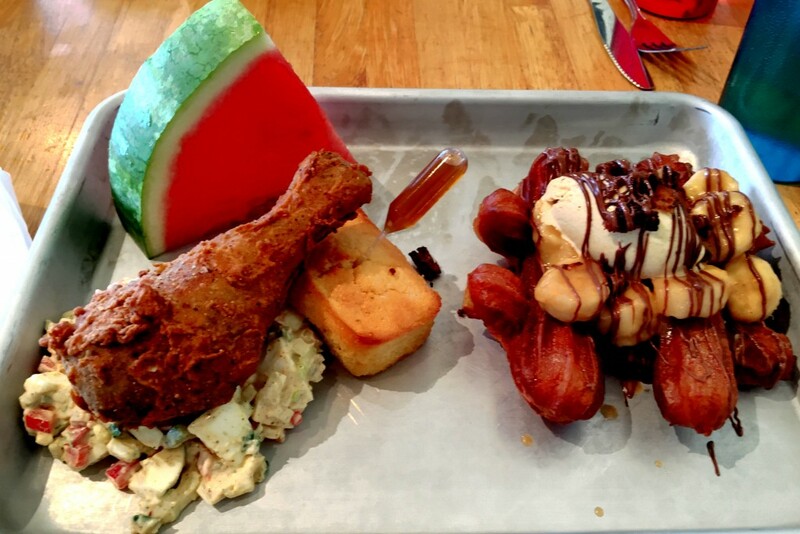 It came with egg salad, corn bread and watermelon. Then the bananas foster churro sweet would satisfy any sweet tooth.